Residents William Judson (far left), Joseph Gold (second from right), and Bettie Smith (far right) smile after being awarded with Easter baskets for throwing the farthest eggs by McPeak's Recreation Director Linda Ohlsen (second from left) at McPeak's Assisted Living's Annual Egg Roll contest on April 18. 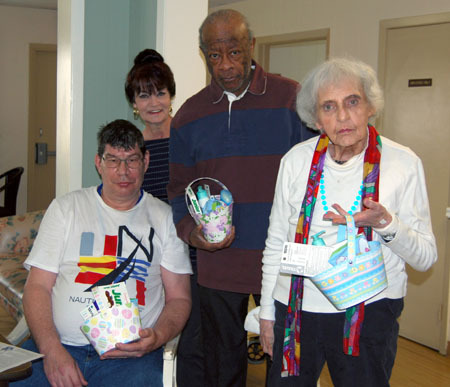 On April 18, residents at McPeak's Assisted Living celebrated the Easter holiday by rolling eggs down the hallway and decorating hard-boiled ones, which took place in the establishment's dining area. Residents competed in the egg roll to win Easter baskets for throwing the furthest egg. Each basket included goodies, such as chocolates, and essential items, like moisturizer and deodorant. After that, each resident was given hard-boiled eggs with egg coloring kits to decorate the eggs to their liking. The top three winners of the egg roll — William Judson, Joseph Gold, and Bettie Smith — were awarded with the Easter baskets at the end of the event.